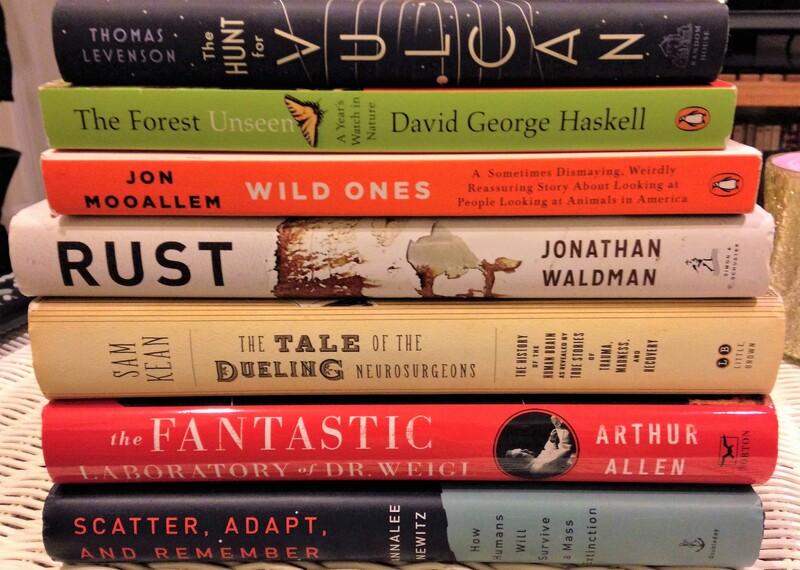 It’s been a long time since I’ve reviewed any books on this blog, but that doesn’t mean I stopped reading. 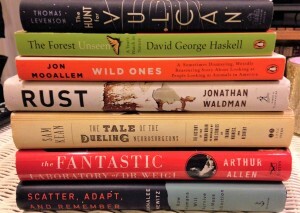 I have devoured quite a bit of non-fiction in the past two years with occasional forays into fiction. I want to share with you a list of the things I’ve been reading lately. Even though I read them all in the last two years, some of these books have been out for a long time, while some are more recently published. I don’t really have a set way of figuring out what I’m going to read; it really comes down to whatever attracts my attention. If it’s listed here, I enjoyed it in some capacity, but I certainly have my favorites that stood out to me more than others. 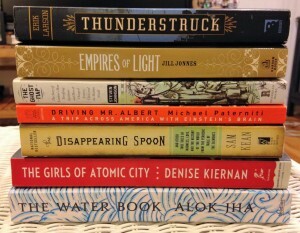 A sample of books from the past two years. Photo by Erin Podolak. In non-fiction, I don’t think I could possibly say enough flattering things about Rust by Jonathan Waldman. I absolutely loved this book, but I was surprised by how much there is to say about a topic like rust. It’s an incredibly compelling story, and I learned a lot not only about the science of rust and it’s history but also about the problems rust poses in the United States today in terms of infrastructure. Having gone to college just steps away from the abandoned Bethlehem Steel mill, I also got a kick out of his adventures exploring the hulking ruins I’m so familiar with. I thoroughly enjoyed the book, and completely recommend it for anyone who likes non-fiction and just learning about a new topic. I was also very impressed by The Forest Unseen by David George Haskell. It chronicles an interesting exercise in which the author watches and records what happens in a single patch of land for an entire year. I thought it was unique and beautifully written. I read a lot of science history books; it’s probably the genre I find myself pulled toward the most. In this realm, I absolutely loved The Girls of Atomic City by Denise Kiernan; it certainly tells a side of the development of the atomic bomb that you don’t often see. I also read three books by Sam Kean, and enjoyed them all. He does an amazing job of putting scientific topics into current and historical context. I find his books consistently entertaining. They’re full of fun narrative bits that bring the topics to life. I also have to specifically mention The Fantastic Laboratory of Dr. Weigl by Arthur Allen. I was completely fascinated by this account of research using body lice during World War II, it was an aspect of the war that I’d never heard anything about. I was sharing fun facts about body lice with friends, family, and acquaintances for some time after I finished it. I think people probably got tired of hearing me say, “did you know….” and having the second half have to do with lice. I haven’t listed below all of the fiction books I read, but one highlight was discovering Michael Crichton for books aside from Jurassic Park. I really enjoyed Sphere in particular. I also spent the better part of the two years listening to every Harry Potter audiobook. Somehow I managed to get to my mid-twenties never having read a single Harry Potter book– better late than never. It probably goes without saying that I loved them. I really enjoyed having them read to me by listening to the audiobooks; hearing everything pronounced in a British accent really puts the books over the top. I also read a collection of short stories by H.P. Lovecraft, and the Complete Sherlock Holmes by Sir Arthur Conan Doyle. I was also a big fan of The Circle by Dave Eggers, although I have to admit I found the ideas it presents for our future quite frightening (like, haul up in a shack in the woods frightening). Which is the point, I think it’s supposed to do that. Or at least make us think more critically about how much we share online, why we share it, and which entities we allow to own our information. I go back and forth between reading paper books and using a Nook. In general, I tend to buy my non-fiction books as books because I truly wouldn’t mind living in a library (which seems possible in a small apartment sometimes). I usually don’t buy paper books for fiction, but I’ve read some that were borrowed. For fiction I typically rely on my e-reader, especially for collections and murder mysteries, which I’d say are my main guilty pleasure. I also just want to mention that I wasn’t asked by any of the authors or publishers of the books listed above to review them or say nice things. No compensation, I just liked them and you might too.